Scallion pancake is a savory,no leavened flat bread folded with oil and scallions(green onions).This originated in Chinese culture and is popular in Chinese restaurants.Unlike other pancakes,this pancake is made from dough instead of batter.Though this is made with all purpose flour but to make it more healthy I have replaced it with whole wheat flour.These make a great simple appetizer.Do give it a try and enjoy with soy sauce !! Oil a large bowl and keep aside. In another bowl,mix the flour(I used wheat flour) and dough to form a smooth dough.If the dough is sticky,add 2 tbsp of flour and knead till its no longer sticky.Knead for 5 minutes and place the dough in the greased bowl.Let it rest for 30 minutes. Roll out the dough on a lightly floured surface,roll out the dough and divide in two balls.then subdivide equally in 3 balls each.Roll out each ball on a floured surface to a diameter of 4" circle. Lightly brush the top with vegetable oil(about 2tbsp for all pancakes) and sprinkle with scallion and salt. 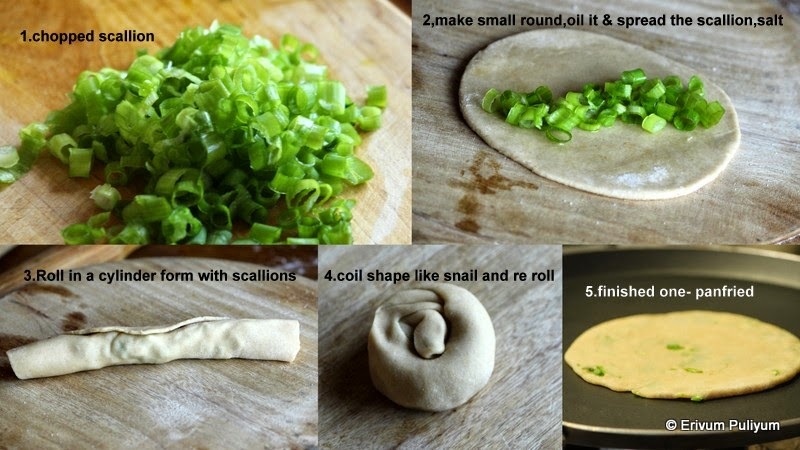 Roll up the circle in cylinder form making sure the scallions are in place.Coil the dough in such a way that it resembles a snail.With a rolling pin,flatten again into disks of 1/4" thick. Heat a non stick pan over medium high heat and when its hot,place the pancakes,pan fry the pancakes like for chapathis.Smear oil on both sides and press down with a spatula to ensure even cooking. Transfer the pancake in a plate and repeat the same step for other rolled balls. Cut in wedges and serve with soy sauce or vinegar dipping sauce. * I used wheat flour but ideally all purpose flour or maida is used. cHINESE REALLY?LOOKS GOOD ANYWAY....MUST BE SO FLAVORFUL. Nice My favorite I made it too. That plate looks so inviting! Any kind of savoury pancakes are welcome in my household. one of my kids fav.. they really enjoy it.. this looks awesome! These pancakes are really tasty.. similar to our parathas..
healthy twist with WW flour, from mediterranean to Chinese? not fair, don't build up secret. Thats a nice pancake.I am sure ur kids would have enjoyed it. These Pancakes are awesome!!! Shall try once! I love scallion pancakes. Thanks for sharing this yummy recipe!